Systec's Pusher Transfer Device (PTD) is an integral section of a conveyor line. The device can be equipped with a conveyor drive section, takeup section, midsection, or can be a gravity conveyor. Systec's PTD is a very reliable and durable transfer mechanism. 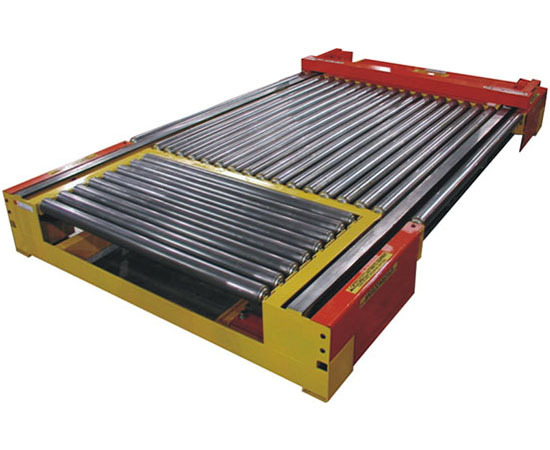 The heavy duty trolley assemblies are equipped with large diameter rollers for smooth movement and load transfer. Additionally, they are assembled with cam rollers for precise trolley tracking and movement. Can be set in the line so that it will push either to the right, or left. Can be used with a Sheet Gripping Device (SGD) for transferring loads that need to be placed on a deck, or bottom dunnage sheets.